This was a great blog post by someone I was reading recently . I thought I wowul pass it along. Do you ever have one of those weeks that just tank? You read, you researched, you prepared, you practiced. In other words, you were really on your game. And yet, somehow, things still fell apart before your very eyes.xThat was me this week. It’s not often that I’m really on my game. Being bi-vocational keeps me feeling pretty stretched most days. But once in awhile, I get into a really good rhythm and I’m filled with hopeful expectations for the night’s Kids’ Club program. This week, I had practiced the songs till I could sing them in my sleep. I had gone to extra lengths to find visual aids — things I could hold while telling the story and pictures I could show on the projector. I inserted moments where the kids could interact and I worked especially hard on making a succinct closing and application. I was ready. Yet, within 4 minutes of telling kids where to turn in their Bibles, I could tell things were starting to go downhill. Kids were whispering to their neighbors. Preschoolers were leaving the group left and right to get a drink (breaking the rules!). I got distracted. I tried to pull them back. But it was hopeless. Goodbye lesson. Goodbye night. Goodbye killer application I had prepared and prayer over. At the end of the night as I picked up bits of play dough and stray basketballs, I could feel myself sinking deeper into discouragement. I never used to get discouraged. Back when I was fresh out of college, enthusiastic about life and virtually unstoppable in my zeal. Nowadays, discouragement and I have gotten to know each other pretty well. Am I really in the right place? Do I even belong in the ministry? Maybe I’m getting too old for this. I did just turn 30 after all. As I sat outside today, watching my kids and the daycare kids play outside, I began reading Angie Smith’s book, Chasing God. She writes about Isaiah’s calling to become a prophet, found in Isaiah chapter 6. God directs Isaiah to prophesy to the people, but He also warns him that his efforts were going to appear fruitless. When I read that line, I almost cried. Because I get it. Sometimes in the ministry, our efforts appear so fruitless. That’s why we devise methods to measure success in ministry or develop charts to assess the spiritual growth of the kids in our care. Because we want feel… I want to feel like what I’m doing matters. Like I’m making a difference. And yet, our call is to obey God. Regardless of the response of the kids. Regardless of the number of parents who pat us on the back at the end of the night. Even if no one seems to notice all your effort. Our call is to obey. To be a voice to the people around us. To share the good news of Jesus where and when we can and then, leave the rest to God. We can’t do it on our own strength. That’s a one way ticket to burn-out. 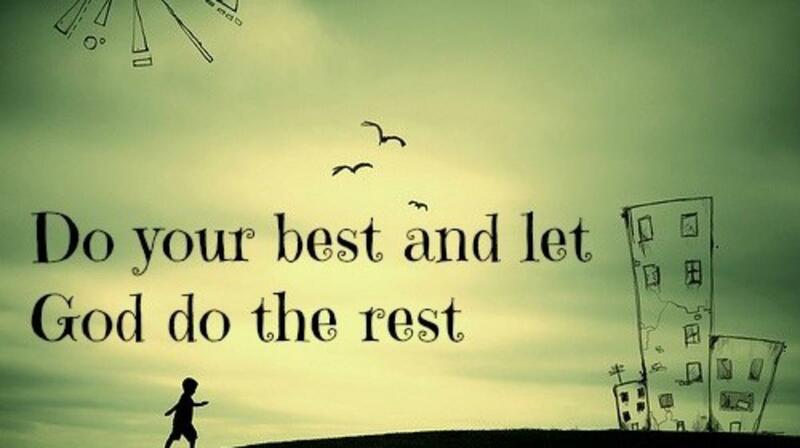 Instead, as Jim Wideman so often says, we’ve got to do our best and let God do the rest.